IDT Releases New Firmware for Bathroom and Kitchen Applications on its Indoor Air Quality Platform | Integrated Device Technology, Inc.
SAN JOSE, Calif., Oct. 4, 2018 /PRNewswire/ -- Integrated Device Technology, Inc. (IDT) (NASDAQ: IDTI), is enabling its customers to design and create new products for improving indoor air quality with today's introduction of its latest firmware for its ZMOD™ family of integrated gas sensors. 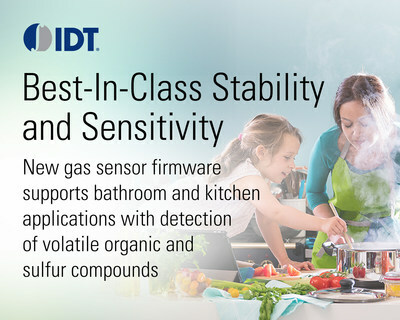 The new firmware enables the IDT® ZMOD4410 sensors to be easily configured to detect gases that indicate the presence of odors in kitchens and bathrooms, making them ideal for automatic exhaust fans and other air changing systems. Unlike other sensor solutions on the market that only have one type of fixed output, the ZMOD4410 sensors have the ability to detect volatile organic compounds (VOC) in individual rooms. The sensor algorithms in this new release will learn the standard environment of these rooms and report changes in gas levels. "This firmware is the latest example of IDT's ongoing efforts of enabling the ZMOD4410 sensors to detect a broader range of gases and to giving product designers and manufacturers more choices and flexibility in creating new products to address indoor air quality," said Mario Montana, vice president and general manager of IDT's automotive and industrial group. "Our ZMOD4410 integrated gas sensors are a superior solution for manufacturers, as the hardware remains constant while the 'method of operation' – the firmware – can be easily upgraded to provide sensitivity for various gases related to odors." The ZMOD4410 gas sensors are an excellent solution for a wide range of indoor air quality applications, including smart thermostats, air purifiers, smart HVAC equipment and other "smart home" devices. They offer best-in-class stability and sensitivity for measuring VOCs, volatile sulfur compounds (VSC) and other gases. Another key advantage is its advanced ASIC-based hardware platform, which supports software configurability and allows for a rapid release of new sensing capabilities on a single platform. The ZMOD4410 sensors are also electrically and chemically tested to ensure consistency from lot to lot, an important advantage for manufacturers with long production runs. The ZMOD4410 devices offer best-in-class reliability as a result of receiving complete qualification for harsh use cases – such as siloxanes – and from an unprecedented life characterization. The ZMOD4410 is the first member of the ZMOD family. It is available in a 12-pin LGA assembly that measures 3mm x 3mm. Visit www.idt.com/gas to learn more and request samples and evaluation kits, or contact your local IDT sales representative. © 2018, Integrated Device Technology, Inc. IDT, ZMOD, and the IDT logo are trademarks or registered trademarks of Integrated Device Technology, Inc., and its worldwide subsidiaries. All other brands, product names and marks are or may be trademarks or registered trademarks used to identify products or services of their respective owners.